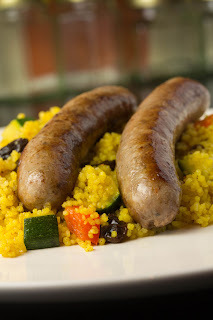 Since Merguez sausages are of a North African origin, with strong links to the Middle East, I quite quickly thought of couscous as a suitable partner for these sausages. I'm a big fan of couscous but even I can find it a bit boring with it on its own, without any extra flavour additions. So, cutting a long story short - this is how I cooked and prepared this meal. This is as always just an recommendation. Take this recipe and make it your own after your own taste and what you have at home. Heat some oil in a pan on a medium heat. Stir in some turmeric and let this sizzle away whilst stirring now and then to avoid burning. Add the pepper and courgette and keep stirring until softened. Pour in the stock. Stir in the couscous and raisins. Remove from the heat and cover it. Let this sit until all the liquid have been absorbed. Fluff with a fork. Serve the couscous topped with the sausages. Many thanks for taking the time to leave a comment. That is very true, simple can be good but sometimes it needs a little bit of help on the way. Remarkable! I made it for my mom and she loved it thanks! She also admired the recipes that I’ve got from www.gourmandia.com and www.Everything-cake.com That I’ve made for her these sites are certainly amazing! Love cooking that’s why I'm finding ways to improve my cooking abilities, I’m glad I found this site , the recipe above was wonderful , I made it for my family and they told me it was delicious!! Thanks, I’ve learned new today!! Take a look at these sites, www.allthemeat.com and www.everything-corn.com for more interesting recipes! !